Best Oral Care Practices, Product Reviews, and More! When you buy Oral B 5000 Professional Care SmartSeries Rechargeable Toothbrush, you can make sure that your mouth, teeth, and gums will really get cleaned. When it is in deep clean mode, it can remove up to 99.7% of plaque particularly on hard to reach places. This toothbrush also features FlossAction technology which ensures that your mouth will be clean overall. In fact, you will notice having whiter dentures only after 3 weeks of use. It can remove both cavities and stains on the teeth, and this is something that other electronic toothbrushes are incapable of. Using OralB 5000 toothbrush will also make you notice how fresher your breath will smell only after a few uses. Despite its strong cleaning abilities, it is gentle on both the teeth and the gums. A regular manual brush only manages to get the gunk out of the teeth that are on the surface, while the round head manages to reach smaller areas. The micropulse bristles have an arrangement that allows it to reach those tiny corners to get every bit of food out, while the floss action feature gives a clean that is very similar to flossing. This does not replace flossing but lessens the need for it. What we do with a regular toothbrush is that we naturally move it vertically and horizontally which manages to get some food out from the surface. This 3D cleaning action utilizes many sorts of vibrations and movements, so the teeth and gums receive a 360-degree cleaning. It oscillates, rotates and sends out pulses which get rid of more plaque than a regular old toothbrush. More often than not we put too much or too little pressure on our teeth while brushing, but the hardest part is to understand when we are doing that. The pressure sensor feature allows one user to see if he or she is putting too much pressure which can be damaging to the gums and the teeth enamel. If there is too much pressure, a red LED on the handle will glow, and you will get a notification on your smartphone screen as well. Much like everything else today this toothbrush is also automated to a great extent with Bluetooth. Now even though this feature might seem odd in such a device, it comes to a lot of use. This lets you monitor your brushing habits with real-time feedback which you otherwise could not have done. Things like pushing the bristles too hard or not using the brush too often give off signals which you can see and use to improve your brushing habits in real-time. “Daily Clean” is what one should use every day and is very mild. “Gum Care” is one that helps to stimulate the gums, which keeps the teeth healthy and sturdy as well. “Sensitive” is for when you feel like your teeth are hurting, or if you have sensitive teeth in general, and uses very moderate speeds. “Whitening” changes speeds to eliminate stains from the surface. “Deep Clean” extends the cleaning time and should be done every once in a while, but not every day. A lot of people who have tried Oral B Pro Series 5000 brush have noticed the difference only after a few days of using it. Should you find it confusing to use it in the beginning, you need not worry as OralB 5000 Smart Series Professional Care toothbrush manual is easy to understand. It also comes with a DVD which explains in detail how their brushing technique works. 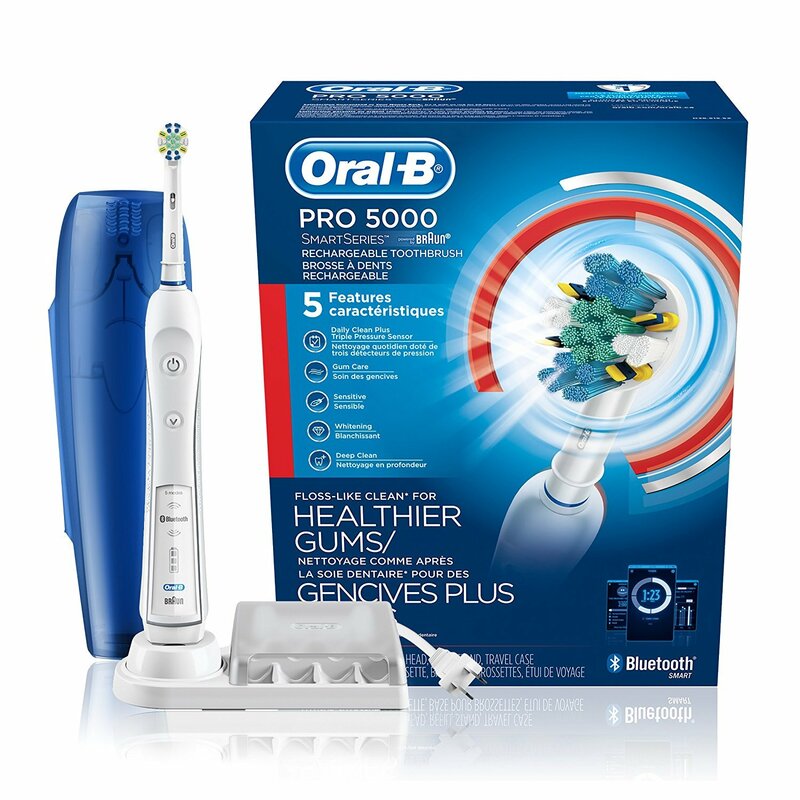 This OralB model also has several more features such as visuals on your brushing time, pressure, and mode which will appear on a separate screen that comes with it. It will inform you as well if you are brushing too hard. You will have every reason to be satisfied with this toothbrush. Maybe except the price. Although this brush costs more than the other same products on the market, it will be worth it since it is rechargeable and you will not need to buy batteries for it to operate. If you think this brush is too expensive for you, you should check out the OralB 3000 model and learn about its differences from this model. Another thing to love about the OralB 5000 electric toothbrush is the fact that it is not bulky. The charger is small which means you can bring it along with you when you travel. Many customers who bought the Oral B loved that it is rechargeable and does not use a battery since it is much more convenient that way. They also liked that this uses an app because it gives a detailed review of what is going on in the mouth and how to improve. However, there were complaints because one has to change the “journeys” to change the modes as it does not allow one to test out all the modes at once. This particular feature of the app will need some getting used to and is a bit hard to keep up with. Several users say it is the best toothbrush they have ever laid their hands on. But still many mentioned it takes time to get used to the many different sorts of vibrations and oscillations in the mouth. These sensations can feel weird at first, but over time one will get used to it. At first, some found the Bluetooth feature to be gimmicky. But after prolonged use, they can all agree because of the Bluetooth technology their dental habits have vastly improved. One customer said it had done wonders for her and her son who has braces. She said her son had seen drastic changes with this brush and that is mostly due to the round head instead of an elongated one which allows it to reach individual tooth separately and with more focus. The son does not have plaques around the braces anymore, nor any grit and his teeth are much cleaner and whiter than before as well. The reviewer herself has also seen less grit on her teeth after using this. This brush is very thorough unlike a regular manual brush and gets rid of grit and plaque with daily use. This is especially great for those who have suffered from cavities or plaque all their life. This reduces the need to visit a dentist’s office over and over again and gives the same service at home on an everyday basis. The Bluetooth feature allows one to monitor their pressure on their teeth and gives a lot of insights on what is going on inside the mouth. This stops one from using excessive force which can be very damaging to the gums, which in turn affects the teeth badly, and also helps them to understand the mechanisms that are best for their teeth. It also gives feedback on the brushing which the user can see as they are doing it. The battery is a keeper on this one because it can go for a straight 10 days on average without recharging. This is an excellent feature for lazy and forgetful people who often skip out on brushing as a whole for forgetting to charge their brushes. It comes with an app that is free and is excellent for people who do not like to brush their teeth for it will surely motivate them to do so. It is fun, it lets you know what to do, and it allows you to go on “journeys” and much more, and all of this serves as reason alone to brush your teeth. It helps to motivate non-brushers to start brushing. Some people have a hard time to find a reason to use the Bluetooth feature. Mostly these are the people who do brush regularly with sincerity anyway. People who are not used to electric toothbrushes sometimes will have to spend some time adjusting to using OralB 5000. The handle is bigger and heavier than the manual brush, and the material of the bristles is a bit rough for some people, and they find it very harsh. This will come off hard and scratchy to some first-time users. The price too is quite high for some of the people since one can get the Oral-B 1000 electric toothbrush at half the price. And a lot are not willing to invest so much into something like a toothbrush. They dislike having to pay more for a feature they are not using. It looks like the main difference between these two brushes is a few extra features that are packed in Oral B 5000 brush. The cheaper 4000 model features 4 modes – Sensitive, Daily Clean, Whitening, and Deep Clean mode. More expensive 5000 model has 4 modes from 4000 model listed above plus additional Massage mode for gentle gum stimulation. Another extra feature of OralB 5000 is the Wireless Smart Guide. Smart Guide is a timer that helps you to make sure you are brushing your teeth for suggested 2 minutes and shows the selected brushing mode. It also features a quadrant prompt which guides you thru 4 quadrants of your mouth. When Smart Guide is not in use, it works like a clock. Each SmartGuide can be paired with one or two toothbrushes. Here is a video where you can see how SmartGuide works. Will Oral B 4000 toothbrush work with SmartGuide from 5000 model? No, SmartGuide will work only with 5000 model toothbrush. Which brush would you choose? It is safe to say that any of these brushes will have the job done. Both units will get those wine and coffee stains off your teeth and remove the plaque build-up. You can be sure you will see the difference in just three weeks or even less. The question you should ask yourself is – is the price difference worth one additional brushing mode and SmartGuide? Would you pay extra for an electronic clock for your bathroom that helps to clean your teeth better? I would. Lately few readers have asked me about the differences of OralB 5500 and 5000 electric toothbrushes. I have looked into it and the only differece I have found is you get one extra replacement brush head.. Comparison with OralB Pro 7000 coming soon! 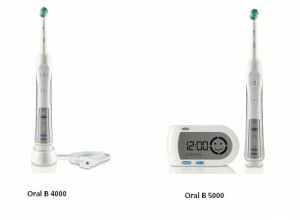 Comparison with Oral B 3000 coming soon!